My greatest take-away from this summer is 81 Dash. After an incident in which some students (aged within the Terms of Service for the back channel they were using) launched their own back channel and used it to log into the room as other students and bully, I had sworn off back channels for younger students. If we could not keep the environment safe for kids, I was not interested. 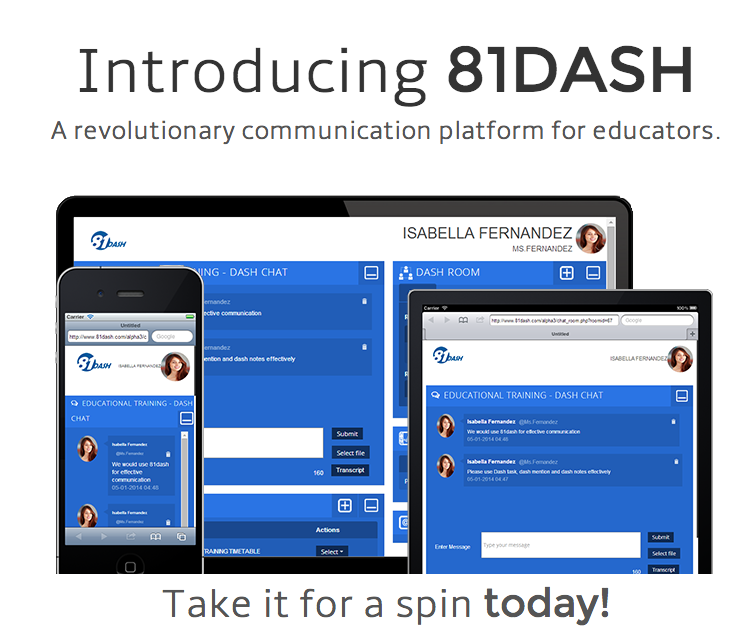 Then I learned of 81 Dash at the Discovery Educator Network Summer Institute from Carlos Fernandez, the creator. Allow for students to chat and collaborate as they watch a video, then use the chat to spark discussion live after the video. Assign a moderator to keep track of the discussions and have students discuss as they learn through an online webinar. Encourage an outside resource to hold a classroom discussion with your students through 81 Dash. During a classroom read aloud, have students discussion the content of the book to sharpen listening skills. Keep a "room" of discussion open through the year for quick feedback and exit ticket responses to the classroom work on a regular basis. Use 81 Dash in a staff meeting to capture thoughts, questions, and ideas while keeping the side chatter down. Use 81 Dash before a lesson to capture "I Wonder" thoughts, during the lesson for the "I Never Knew" and after the lesson to have students share a document in which they summarize the learning. There are so many ways to use this tool. I cannot wait for school to start to see the results of learning with 81 Dash!